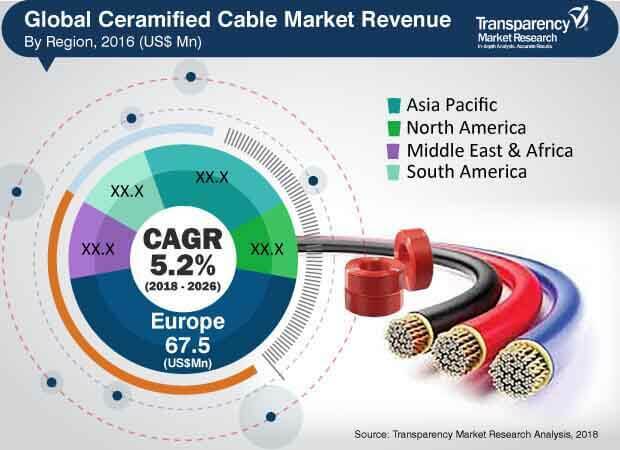 According to a new market report on the ceramified cable market, published by Transparency Market Research, the global ceramified cable market is expected to reach US$ 277.0 Mn by 2026, expanding at a CAGR of 5.2% from 2018 to 2026. According to the report, the global market is anticipated to be influenced by a range of macroeconomic and industry-specific factors. Europe is expected to be at the forefront of global demand, with the market in the region growing at a CAGR of 5.8% through 2026. Applications of ceramified cables in fire and smoke detection systems are anticipated to significantly drive the global ceramified cable market. The global ceramified cable market is broadly segmented by voltage level, application, and end- use industry. Based on voltage level, the market has been segmented into Low Voltage (Less Than 600V), Medium Voltage (600V to 69kV), and High Voltage (Greater Than 69kV). Based on application, the market has been segmented into fire and smoke detection systems, emergency lighting and signage, emergency communication, rescue elevators, emergency generators, and others. The market is further segmented on the basis of end-use industry into building, industrial, transit, and others. The major factors governing the growth of the ceramified cable market is the increasing adoption of these cables in highly temperature sensitive applications, fueled by the strict government regulations to enhance the safety of residential and industrial areas. Another factor aiding the growth of the market is the cost and technical advantages offered by these cables as compared to other competitive products. According to the research study, the fire and smoke detection systems segment contributed the dominating share to the global market and are analyzed to expand at a prominent growth rate during the forecast period. The applications of ceramified cables in emergency generators is anticipated to follow the fire and smoke detection systems and is anticipated to witness a compound annual growth rate of 5.1% during the forecast period. Europe held the largest market share in terms of revenue and volume in 2017, due to increasing focus on improving safety in critical application areas, for instance high rise buildings, which require longer duration for evacuation in case of fire emergencies. Moreover, the market in Europe is anticipated to grow at a remarkable compound annual growth rate during the forecast period, followed by Asia Pacific. Some of the key players in the ceramified cable market are Wacker Chemie AG, Siccet SRL, CavicelS.p.a., Prysmian Group, Nexans S.A., Marmon Engineered Wire & Cable (VITALink), Tekab Co. Ltd., Birtas Instrumentation Cables, Bhuwal Cables Ltd., and KEI Industries Limited. Companies are focusing on expanding their business through strategic acquisitions and partnerships with several end-use industries.